My Mantra for December: LIGHT and LIFE - Real life, on purpose. It’s been a while since I shared my monthly mantra here, although I have been setting one each month. While a word of the year is great, I have loved being more intentional about specific things for shorter periods of time. Hooray for a successful experiment! I’ve been thinking about Christmas since probably July…maybe longer. Last year felt so rushed and haphazard, and the year before was much the same. This year I really wanted to be mindful about the entire season: the activities we choose, the way our home is decorated, the gifts we give, all of it. My kids are so young that anything remotely Christmassy feels magical. However, they’re also getting old enough to have some expectations too. And I don’t want our family to fall into a habit of expecting the wrong things. As I’ve pondered what I want December to feel like and what things I want to prioritize, I keep coming back to the same words. I’ve heard them on podcasts, in songs, in scriptures, and in casual conversation, enough that I can’t chalk it up to coincidence. My mind is fixated on this phrase; it resonates with my soul. 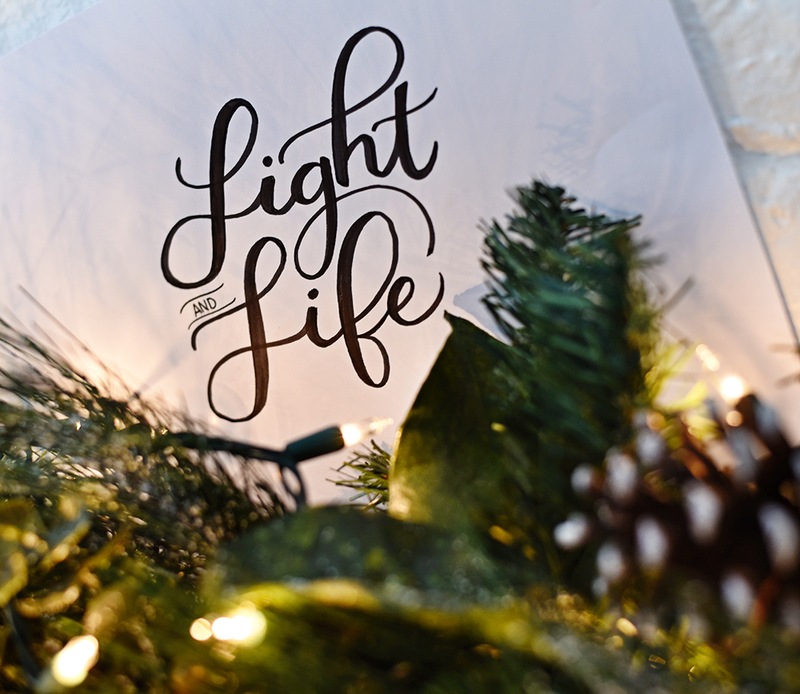 The Christmas season should be about LIGHT and LIFE. In the second verse of “Hark! The Herald Angels Sing” is the line, “Light and life to all He brings.” Since Christmas is about the birth of Jesus, and He is the source of life and light, it only makes sense to embrace that fully this season. Later this month I’ll share a candlelight nativity so we can all celebrate the Light that came into the world. I’ve spent the last week slowly filling our home with candles + twinkly lights + greenery. I want to invite friends into our home, bring life-giving treats to theirs (because #foodismylovelanguage), and embrace all the emotions that come with living in this perfectly imperfect world of ours. This Christmas season I hope to eliminate anything that takes my focus away from Him. If it doesn’t bring light and life into my heart and home, then it can wait till next year. Or maybe it’s not important at all. I know at some point I’ll struggle with all this. The Grinch in me will rear his ugly green head, feeling overwhelmed and annoyed and exhausted. I mean, it’s the most wonderful time of the year and all, but we’re also renovating our master bathroom. And I have three small children. And life goes on. But I also know those challenging moments are the very ones when I need to open my mind to light and life the most. Joy to the world, friends. The Lord is come. Unrelated to the text of your post but your hand lettered Light and Life is perfection. Well done, my dear. Why thank you! High praise, considering the source!